Go places. Learn the business English skills you need with Bridge. 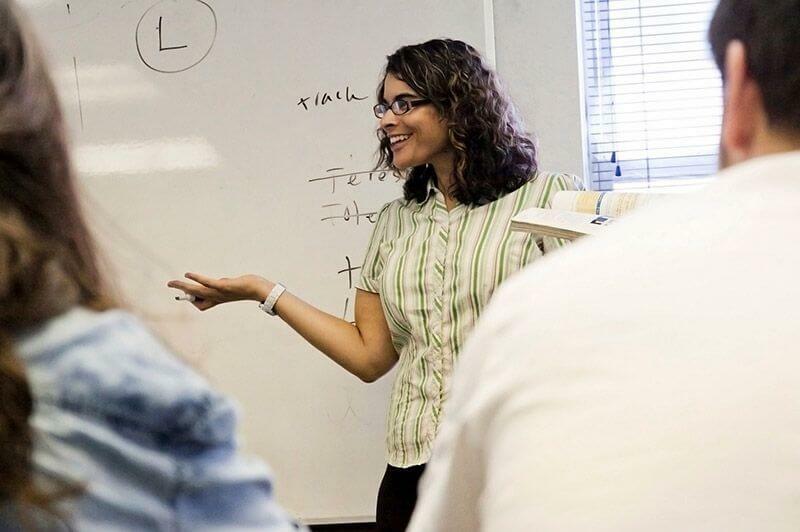 As a student enrolled in our Business English courses, you can take advantage of our Executive Enrichment Program. In this program you can further improve your English language skills outside of the classroom by attending top-class executive events. This program is included in the Business English program at no additional cost. Currently, we offer the Business English Program to our more advanced English language students. Your English proficiency should be Level 4 or above to do the course. Your level of proficiency will be tested upon your arrival at the school to ensure proper placement in class. Perfect your business English language skills in an intimate group setting. You’ll learn to properly express yourself in presentations and meetings, and on phone calls. You’ll also explore different cultural business practices with your classmates from around the world to understand the complex themes and issues that affect international business. Group classes include periodic field trips that enhance classroom topics. For example, we may go on a tour of a local business or to the local branch of a multinational. You will also hear from prestigious guest speakers from the local community and beyond. In this program you will enjoy the lively dynamic of small group classes with the added benefit of one-on-one tutoring each afternoon. You can choose the area of focus for your private sessions, making this a truly customizable program. The Business English Combo Course is one of our most popular options. It combines the best of both worlds—the collaborative nature of the group classes followed by intensive and personalized one-on-one lessons. Want to improve your English as quickly as possible? The Full Immersion program is for you. You’ll benefit from 37.5 hours a week of private classes in a business context. You’ll learn from timely and relevant articles in leading business publications and from your textbook. As part of your immersion, you’ll enjoy lunch with a teacher every day, so you can continue to practice speaking English in a social context. This flagship program is the gold standard and the fastest way to improve your English. With this program you’ll also have full access to the Executive Enrichment program so you can apply what you are learning outside the classroom at networking events, business lectures, and workshops. Apply your English skills at real-world lectures, networking events, workshops, and more. For true success in learning any language, you need to practice outside of the classroom. The Bridge Executive Enrichment Program places you in real-world situations where you can apply relevant vocabulary and newly acquired language skills. We’ve partnered with prestigious local institutions to offer you the following workshops, lectures, and networking opportunities. Students from Fuji Electric and Business English teacher Robyn Jacobs listen to a presentation during the Cisco field trip. Trying out the Cisco virtual meeting equipment. Walking down the pedestrian mall in Boulder after the Cisco field trip. Jason McLaurin, Director Mobility Sales for Cisco Systems Ltd., speaking to Bridge students during a field trip to Cisco's offices in Boulder. Where's that software? Katsuhiro Kodani of Fuji Electric checking out Cisco technology. Wrapping up the Cisco field trip. We’re a corporate sponsor of the IBC, a Denver-based group of international business executives. The IBC hosts monthly events offering an amazing opportunity to network and gain business insights from an exceptionally wide variety of people. Recent events have included an evening with the New York bureau chief of The Economist, a cross-cultural presentation by the CEO of Western Union, and a look at what it takes for foreign companies to invest in Brazil. Most of these IBC events take place after school with occasional ones available on weekends in the summer. The University of Denver’s Daniels College of Business, through its Voices of Experience series, hosts regular lectures by well-known business leaders who give fascinating insights into how they’ve achieved their goals. The presentations are followed by Q&A sessions and an opportunity to network. These events take place in the evening after school. We’ve partnered with the World Trade Center in Denver, an organization designed to serve as a focal point and resource for Colorado’s international business community. The WTC offers professional development one-day or half-day courses on issues relevant to your understanding of international trade and business. Typical training events include seminars on social media, global cross-cultural communications, and intellectual property rights. The WTC also offers regular networking events. These training events and workshops typically take place during school hours and we will adjust your class schedule accordingly. Get the specific skills and vocabulary you need in your field. Depending on your industry, you may need to focus on specific vocabulary and skills that aren’t covered in a traditional business English curriculum. We’ve created a number of English for Special Purposes (ESP) courses to meet those practical needs. You can enroll in these private courses as part of an immersion course, or as the one-on-one component of a Group-Private Combo Course. You can also take English for Special Purposes online as part of a BridgeVirtual program. For more information on our special English courses, contact a student advisor.